Provide comfort for the family of Larry Vagt with a meaningful gesture of sympathy. Larry (Lawrence) Frank Vagt Jr. was born September 9, 1946 to Kathryn (Neseth) Vagt & Lawrence Vagt Sr. in Rochester, MN as the oldest of 4 siblings. Larry served his country with the Army during the Vietnam War, including a cold year at Murphy’s Dome in Alaska. After his service he returned to Rochester, married Sandra Jean Mahoney and had two daughters, Micki and Melynda. Larry worked for Ryerson Steel for 30 years. In 1976, along with three friends, he founded the Twin City F-100 club for those with an admiration of Ford F-100 Pickups & Panel Trucks. On April 13, 1984, Larry married Marget (Margy) Moore who introduced him to horses. Larry had a gift with horses. 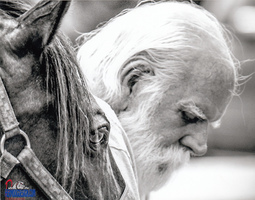 His confidence, calm and gentle ways earned him the title “horse whisperer”. He loved training horses and utilized his skills to mentor countless kids. Larry passed away on January 20, 2019 at home with his wife by his side after a long, courageous battle with cancer. He was a wonderful man with a gentle soul, a great sense of humor and an unbeatable laugh. He was a true gentleman and will be deeply missed by his family, friends and all those that knew him. Larry is survived by his wife Margy Vagt, two daughters Micki (Tom) Diers and Melynda (Bill) Vagt, brother Chris (Kim) Vagt, Sister Tres (Jerry) Stich, three Grandsons Nathen, Ryan & Cory Stenmark and three great-grandchildren Brielle, Carson & Jaxton Stenmark. He is preceded in death by his parents Lawrence and Kathryn as well as sister Julie McGowan. A private family service will take place at Huber Funeral Home in Excelsior. A larger celebration of life will take place this spring in his honor. In lieu of flowers, memorials are preferred. We encourage you to share your most beloved memories of Larry Vagt here, so that the family and other loved ones can always see it. You can upload cherished photographs, or share your favorite stories, and can even comment on those shared by others.